In four reports presented to the U.S. Congress, Treasury Secretary Alexander Hamilton made clear that only his approach would solve the young nation’s unprecedented crisis: resolve the national debt in good faith, preserve the international role of U.S. credit, initiate and expand broadscale productivity and full manufacturing employment, and fulfill the scientific advancement that Hamilton uniquely foresaw would achieve American greatness. In June of 2014 Lyndon LaRouche provided his precise scientific assessment and cure for the economic crisis facing the American people today. This program is now known as his Four New Laws. Now, two and a half years later, his assessment in the wake of the recent election, could not have been more prescient. If the incoming Administration has sufficient wisdom and courage, the path towards economic recovery and national success has been provided. This is not an opinion, nor an option, but as LaRouche indicates, an immediate necessity. These four laws, as developed by Mr. LaRouche, not only address the perceived problems of our nation, as are well known, but they also have the power to address the underlying root cause for the long-tolerated degradation of our nation—which fundamentally lies in our misconceptions regarding the voluntary creative power of the human individual as it relates to Universal development. There is a unique quality known to qualified persons of political leadership: when facing an unprecedented crisis there is only one pathway which will suffice to sufficiently resolve the intrinsic contradiction of the problem. That contradiction can be defined in this way: that the cultural assumptions that had until that point been regarded as true, whether about society, economics, the Universe more generally, etc., must now be considered failed assumptions, and acknowledged as such. Yet the new cultural outlook, the one which is now required for successful survival—though it is entirely distinct from its predecessor and shares no similar assumptions—remains lawful when perceived from the progress achieved in past periods of cultural advancement. It is this quality of transformation, from a failed system towards one with long-term success, which is now dominating the majority of the human race throughout much of Eurasia and beyond. As Russia and China each emerged from the collapse of the Cold War system in 1989, albeit through various incarnations, they have consolidated a new state of success within the framework of a new paradigm of human development (one entirely consistent with, if not inspired by Alexander Hamilton). This new paradigm is a far cry from the post-Cold War framework within which western elites have perpetually deluded themselves of their own intrinsic greatness. To achieve this transformation of U.S. culture, also known as successful survival, the LaRouche-Hamilton pathway must be both followed and fulfilled, i.e., the necessary direction must be taken, and the subsequent actions must be sufficient in comprehensive effect. The college try, or being practical, will not only be the cause of failure, but at moments of great crisis, they will beget far greater destruction and loss of trust than the average New York liberal can imagine, all while the catastrophic effects are felt in far away places. Presidents Lincoln and F.D.R. each recognized this higher, narrow path as an intrinsic quality of the Universe, a quality which lies behind the veil of mere appearances. Nothing less than this quality of leadership will suffice today. This road today is the narrow path set forth by Hamilton 225 years ago, distilled into four simple laws by Mr. LaRouche, whose public political record began no later than 1966 in New York City with his unrivaled forecast of the collapse of the Bretton Woods gold-reserve system. This was followed by his eight consecutive campaigns for the U.S. Presidency, beginning in 1976—all of which were run in accordance with the political and economic tradition of Alexander Hamilton—and sustained by his ongoing leadership today. First the Glass-Steagall Act must be reinstated, and Wall St. speculation eliminated. Second, a Hamiltonian National Banking System must be established, to secure the economic power to rebuild the nation. Third, Public Credit must be issued for technologically advanced great projects, including collaboration with other nations such as China, to create millions of productive jobs. And fourth, the productivity of each individual citizen must be increased with a commitment to master the Universe, with an emphasis on the development of thermonuclear fusion power in a crash effort comparable to the Manhattan Project during World War II. The Nov. 18 New York Times carried on its front page an exhortation, “Trump-Size Idea for a New President: Build Something Inspiring,” discussing and proposing a number of regionally important infrastructure projects. But the leading economic power of Asia, China, is rapidly building new infrastructure projects, domestically and internationally, which make the Times‘ proposals appear not very “inspiring.” A national high-speed rail network surpassed 12,000 miles built, in 10 years, to cite just one example. Though the Times proposed high-speed rail lines along parts of the East and West Coasts, it was unable to conceptualize the great projects the U.S. economy really needs. These include an entirely new, continental water management and water creation (desalination, ionization) system to rescue the whole West from advancing desertification; a continental high-speed rail network which includes going across the Bering Strait to Eurasia and down into Mexico and through the Darien Isthmus into South America; a project to industrialize the Moon; breakthroughs to fusion energy and plasma industrial technologies; a major revival of NASA’s solar and deep-space plans. Thus, two conditions for president-elect Trump’s “big plans” for infrastructure. They must be carried out in cooperation with China and its new international development banks. And the proposals for financing them — including that suggested by the Times — must be scrapped, in favor of Alexander Hamilton’s design of national credit institutions. Franklin Roosevelt’s “Four Corners” and other infrastructure great projects are cited as exemplary throughout the Times piece. The Hoover Dam was a tunnel-and-dam project on a scale never attempted before, requiring tunnel-boring machines and other industrial capacities which did not exist. The Tennessee Valley Authority was, among other things, a near-continental integrated system of water management, flood control, power production, rural electrification. Very large national science facilities which were developed at Oak Ridge, Los Alamos, Livermore, and Chicago were also large industrial projects at the very frontiers of the nuclear sciences. And so on. President Kennedy’s Apollo Project was human “transportation infrastructure” into the Solar System. It was infrastructure work at both the scientific and industrial frontiers. Building these “things that are hard,” as Kennedy called them, caused productivity leaps in the U.S. economy and labor force which were unprecedented since the 1870s. There has been no such productivity growth in the last 50 years. For these purposes, the “public-private partnerships” (PPPs), made famous in Democrats’ policy shop-talk since their invention by Felix Rohatyn of Lazard Bank 50 years ago, are completely incapable. Here there are no private financial profits to be had (except for the constructors and their lenders) on a scale of less than a decade at best; there are only new levels of productivity. A breakthrough to fusion power will not provide “user fees,” only a new future for America and humanity. From the Republican side, the circulated “Trump plan” for an infrastructure bank is even more unworkable; it could be called a “private-private partnership.” The Treasury merely provides $140 billion in tax credits up front to induce investment funds to form an “infrastructure bank”; then Uncle Sam steps aside and guarantees these plungers while they borrow another $850 billion and control the selection of infrastructure projects to be financed by the trillion-dollar bank! With the infamous zero-interest rates already rising rapidly at the very smell of this kind of thing, that’s one big mass of debt service incurred by this perhaps-Trumpian bank. The Treasury is supposed to recoup its $140 billion, gradually, by taxes paid by construction workers, engineers, etc. on the projects. But the lenders of the $850 billion are to be provided for by “user fees” (which are also a big feature of PPPs). But at the frontiers of “great projects,” such as described above, there are no user fees for quite some time! If user fees are the means of paying the infrastructure bank’s debts, its managers will grab at short-term “things that are easy” like new airports, toll bridges, etc. Forget productivity advance. A great chance to rebuild America’s economy will be thrown away. Enter Alexander Hamilton — who invented national credit for manufacturing, productivity, and infrastructure — and his students: John Quincy Adams (2nd Bank of the United States); Henry Clay (Fiscal Bank of the United States); Abraham Lincoln (Greenback and National Banking Acts of 1862, 1863 and 1864); and Franklin Roosevelt (Reconstruction Finance Corporation). Using Hamilton’s principles, a national bank should be capitalized with existing Federal and state debt, stretched out by the Bank to the timescale of the great infrastructure projects themselves; the capital subscribers are rewarded by healthier interest rates and a Treasury guarantee. A Hamiltonian national bank is a commercial bank as well — states and municipalities, as well as businesses, will use it as a bank of deposit, while it buys or discounts their own infrastructure bonds. A means of servicing the longer-term debt of the bank (“extinguishing it,” in Hamilton’s words) must be provided which is — for the initial building period — independent of the Bank’s great projects. A NEW TAX — or, the assignment and increase of an existing one. Neither Hamilton, nor Washington, nor Lincoln, nor FDR, nor JFK were sissies about imposing the taxes necessary — and no more! — to sustain the credit for their great advances in our nation’s productivity. Watch and learn what it would mean for the United States to join the New Silk Road. Dear ladies and gentlemen, honorable guests of this very important conference, where I’m extremely honored to be able to speak to you. Now, this conference is very important not only for Peru and all of Latin America, because it deals not just with infrastructure and rail lines, but it is really about a paradigm shift to a completely new economic system which is eminently possible to realize. Now, obviously, the context of everything has changed with the unexpected, or for some unexpected outcome of the American election. Because it was not just that people voted for Trump, they voted against the war policy of Hillary Clinton, which they perceived as the continuation of the present confrontation of the Obama administration towards Russia and to a certain extent against China. And they also voted against the absolute injustice of a system which has increased the gap between rich and poor to an unbearable degree. Now, if you look at what caused the actual election result, it was the voters in the so-called “rust belt” in the formerly industrialized states of Ohio, Wisconsin, and Pennsylvania, people who lost employment, who became impoverished, who had no future, and they just gave an absolute refutation against these policies. It is an open secret that the U.S. economy is a much worse state than the official statistics would try to tell you. As a matter of fact, in certain European economic circles, they call the United States “the country of the limitless statistical possibilities,” meaning that these statistics are all massaged and are a paper tiger. And as people know, you can’t eat a paper tiger, you can’t fill a hungry stomach with that. The revolt of the population took a first, very, very dramatic expression in June with the Brexit, the announced exit of Great Britain from the European Union and I would say that the Trump victory in the United States is a reflection of the same rejection of the policy of the establishment, where people feel that this establishment has completely gotten out of synch with the interests of the common people. Therefore, unless the policies are dramatically changed, in all of the United States and in all of Europe, and many other parts of the world, one has to expect more such populist revolts, such rejections of existing policies. In his acceptance speech, where Trump all of a sudden was more statesmanlike, he not only promised that he would be the President for all Americans, but he announced that he would rebuild the United States economy: Build roads, bridges, train systems, he even said that he would make the United States the most modern infrastructure in a few years, which is a big promise, given the infrastructure development in other parts of the world already. But he promised that he would reconstruct the real economy of the United States. This obviously will have a big impact on the ability for the Latin American countries to put a lot of emphasis on their infrastructure development. This is not an option, this is an absolute necessity, because the world, at least concerning the trans-Atlantic part of the world economy is facing a larger explosion than 2008. Many people have illusions about that, but we are sitting on a powder keg, where basically the too-big-to-fail banks, those you cannot let go under because they would bring down the whole financial system, and whose managers you cannot put in jail for the same reason, they are much bigger today than they were in 2008; the debt and derivatives exposure is 40, 60, 80% larger. Take Deutsche Bank alone: They have a derivatives exposure of EU42 trillion, that is four times the entire GDP of the European Union and 12 times the GDP of the German economy. Deutsche Bank alone, with their derivatives exposure, has all the major too-big-to-fail banks in Europe and the United States as their derivatives counterparties, so therefore if they go bankrupt, they would bring down practically all of these banks. But the same condition is true for the Italian banks, for many of the British banks after the Brexit. And then you have the problem that these banks all have had dramatic losses in the in the last years because of criminal fines, because they have been involved in a large variety of crimes: LIBOR manipulation, three-digit billion sums; money laundering; HSBC. You had the Wells Fargo in open fraud against their customers, the same for Deutsche Bank. And so forth and so on. The only way how you can stop that and prevent a repetition of a 2008 explosion on a larger scale, is you have to implement, immediately, the Glass-Steagall banking separation law which Franklin D. Roosevelt implemented in 1933. That has to be the absolutely necessary first step, but it has to be followed with the Four Laws of Lyndon LaRouche which I will talk about a little bit later. Now, this is very dangerous and must be remedied. With the election of Trump nothing is clarified yet. The only thing which has been eliminated is the immediate danger of World War III, but if the economic reforms which I’m now going to talk about are not being implemented on a global scale, we may be back in a war danger in the very short term. So do not be at ease, but be optimistic, because the alternative economic system is already in place. And since most of the media have not paid adequate attention to that system, let me elaborate it now, and you will see that we are actually in the middle of a huge development perspective already. China, in particular President Xi Jinping, proposed three years ago the creation of a New Silk Road. He consciously referred to the ancient Silk Road which 2,000 years ago during the Han Dynasty, connected China with Europe, and at that time it was not only the exchange of goods such as porcelain, silk, book printing, many other things; but it was also the exchange of culture, of ideas, and most importantly of technologies — not just silk but the technology of how to make silk, how to print books, how to manufacture porcelain. At that time it led to an absolute increase in productivity, of culture. It means a tremendous upgrading of civilization at that time. Now, today, it would mean, and it is already meaning the exact thing in terms of modern technologies, such as fast train systems, space cooperation, fusion and fission research, other advanced technologies. Since President Xi Jinping announced this in Kazakhstan in September 2013, there was an absolute explosion of economic activity, and already, now, this whole project is 12 times larger than the Marshall Plan which reconstructed the German economy in the postwar period. It already involves 4.4 billion people, the majority of mankind; it involves more than 100 nations and large organizations. And to just give you an enormity of what has happened in these three years, I want to give you a short overview of the different projects which are already are near completion or under way. There are presently six large land routes being constructed: This is the “belt” in the One Belt, One Road conception of the Chinese. Most of them are in different degrees of completion. You have the Eurasian Land-Bridge connecting China, Kazakhstan, Russia, to Europe. Then you have the different corridors: one going from China to Mongolia to Russia; a second one from China to Central Asia to West Asia; a third one is the corridor between China and Pakistan, which China has invested 46 billion in alone. The fourth, Bangladesh, China, India, Myanmar; the fifth, from China to Indo-China; and then you have in addition to that, the so-called 21st Century Maritime Silk Road, which refers to the “road” in the One Belt, One Road. From Chinese ports, this Maritime Silk Road goes to the South China Sea to the India Ocean, to Europe; a second route from China through the South China Sea to the South Pacific; and all of these projects are based on a “win-win cooperation” with the idea that not only China profits from them, but all participating countries equally. Xi Jinping made this really his personal project. And if you look how many personal travels he conducted since these three years, he went to 37 countries on state visits: 18 in Asia, 9 in Europe, 3 in Africa, 4 in Latin America, 3 in Oceania. He made free trade agreements with 11 states along the One Belt, One Road. He made bilateral agreements with 56 states. He made joint Memorandums of Understanding for planning operations with scores of regional organizations, such as the European Union, the Central and East European Countries (CEEC), the Mekong neighboring states, the African Union, the Shanghai Cooperation Organization, the Eurasian Economic Union (EAEU), ASEAN, ASEM (the Asia Europe Meeting); so this is developing to be a very integrated network of projects. Part of this are transport lines which represent the traffic arteries along these countries. It involves the agreements of telecommunications, power plants, power grids, the creation of conditions governing location which makes landlocked areas as suitable for investment as oceans or river sites. It is important for agriculture and development to develop these conditions. It includes the building of many new cities. As of mid-2016, this year, 39 cargo routes have developed from China to Europe; bringing trains every week. It involves the activities of many Chinese state corporations, such as the China Railway Group Ltd., the China Communications Construction Co. Ltd. It involves 38 large infrastructure projects in 26 countries. It involves new transport grids through landlocked areas which were completely unreachable before. It involves the upgrading of ports, the modernization of existing infrastructure. In the Chinese part of the Silk Road, China built by the middle of this year, 98 new airports; very soon it will be that no city in the One Belt, One Road region will be farther away than 100 km from an airport. 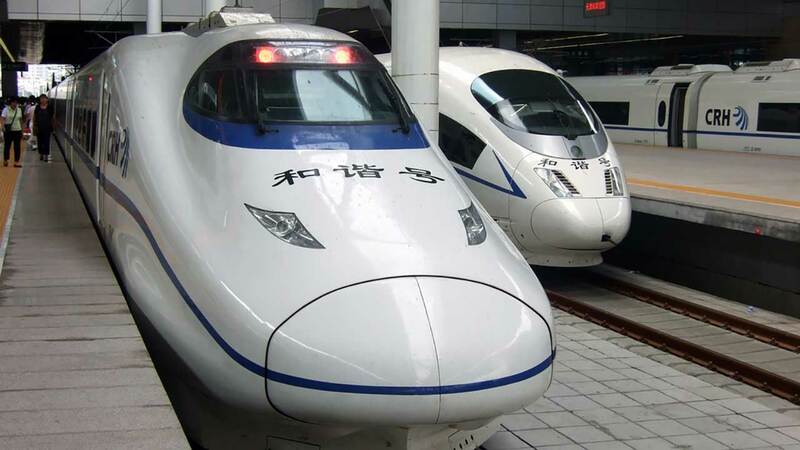 Within China, China has already built 20,000 km fast train of a very excellent model of fast train developed by China; by the year 2020, they want to have 50,000 km fast train system inside China, connecting every major city through such a system. And this is supposed to be extended to the other countries. The following Chinese state companies are involved: Telecom China Unicom, China Mobile, TDLTE Net 4G mobile telecommunication; and they have now contracted for plans in 30 countries, including China, the United States, Japan, India, Saudi Arabia, Russia. Already in the last three years, this has led to an explosion of trade: Between 2013 and 2016 the trade volume increased by $3.1 trillion trade. There are $51 billion direct investments in these countries. China has created five economic special zones across the borders. One in Dongxing on the border with Vietnam; another one Ruili on the border with Myanmar; another in Erenhot on the border with Mongolia; another one called Manzhouli on the Russian border. Plus in the port of Mongla in Bangladesh in the Bay of Bengal. In addition, they have created 15 zones of economic cooperation across borderlines: In the northeast of China in Liaoning in the border area with North Korea. A second one in Jilin, in the border area of North Korea and Russia. Another one in Heilongjiang, with Russia. Another one in the south of China in Guanxi. And a fourth one in Yunnan at the border with Vietnam. Four such zones have been built in Xinjiang on the border with Kazakhstan. By mid-2016, China had agreement for altogether 52 economic special zones in 18 countries along the One Belt, One Road. Three of them are already fully operational: the industrial park between China and Belarus; the second one between Thailand and China, the Rayong industrial zone; and the third one Indonesia-China Integrated Industrial Parks. The other ones are in different degrees of realization, such as the industrial parks in Cambodia, Vietnam, Pakistan, Zambia, Egypt, Nigeria, Ethiopia, Hungary, and four such zones in Russia. Part of this is an upgrading of the energy infrastructure. China is presently participating in 40 energy projects abroad, power plants, electricity grids, oil and gas pipelines in 19 countries. The Central Asia-China gas pipeline which was started in 2014, the very huge Russia-China gas pipeline which also was started in 2014. And it includes joint nuclear projects with China and Romania, with China and Great Britain, China-Pakistan, China-Argentina. China is also involved in the construction of water projects in Angola, Brazil, Nepal, Pakistan, Argentina. To finance all of this China also initiated, together with the BRICS countries, a completely alternative financial system, responding to the fact that in the last decades the IMF and the World Bank had betrayed criminal neglect of funding infrastructure in the developing countries, leading to the absolute underdevelopment of such continents as Latin America or Africa, or large parts of Asia. China remedied that by creating the Asian Infrastructure Investment Bank (AIIB) in 2015, which immediately, despite massive pressure from Washington not to do so, had 57 founding members, including Great Britain, Germany, France, Australia, New Zealand and Canada — very strong allies of the United States, which found it more attractive to join this bank. This bank have $100 billion founding capital. Then in addition, the BRICS countries created the New Development Bank in July 2015, also $100 billion starting capital. In December 2014 already, China created the New Silk Road Fund, $40 billion; the Maritime Silk Road Fund, another $40 billion. But the gist or the largest part of this financing still comes from state banks such as the China Development Bank which is involved in more than 900 projects for transport, energy, raw materials in 60 countries; then the China Export-Import Bank, which is involved in more than 1,000 projects — roads, rails, ports, power plants, pipelines, communications, industrial parks in 49 countries. Then the China Export and Credit Insurance Corp. supports investments totalling $2.3 trillion in medium- and long-term projects in the high-tech area, in machine-tool building and so forth. Then, as a very important additional element in the new financial system, is the Contingent Reserve Arrangement (CRA) of $100 billion also, which was the reaction of the Asian countries and the BRICS countries to the speculative attacks which caused the Asia crisis of ’97 in which such speculators as George Soros speculated the currencies of a country in one week down by 80%. So the CRA has been created to counter such speculative attacks for all the participating members. Now, at the G20 Hangzhou summit, which this year was organized by China, China put a lot of emphasis on innovation, that innovation must be the driver of the world economy. Until the middle of this year, China signed in this spirit, already Memorandums of Understanding with 56 countries for scientific cooperation, joint space research, joint investment in research of energy environment. They have created 38 science centers and technology centers, research labs, R&D industrial parks, exchange of scientific personnel and especially an exchange of several thousand young scientists of the countries along the One Belt, One Road. So China which has completely understood the science-driving ability of the space program is now conducting probably the most advanced space program of all countries in the world. They will go to the far side of the Moon next year, which will open up tremendous windows into space, because it’s more shielded from the radiation from the Sun and from the Earth, so you will find totally new insights into the laws of the universe at that time. And China, by the year 2022 will also have, as it stands now, the only functioning space station. And they have invited especially developing countries to be part of that, so that their development is not held back. If you look at this development it is absolutely breathtaking. The first maps which were published in 2013 just showed very narrowly the One Belt, One Road line from China to Europe and the Maritime Silk Road. But if you look at the three years of development and fill in the projects which I just have named, you can see that this conception has grown exponentially. We, the Schiller Institute, are not unrelated to that, because this is a project we have pursued since more than 25 years: The so-called Productive Triangle linking the industrial zones of Western Europe with those of Eastern Europe was our answer to the fall of the Wall in 1989. So the Iron Curtain was no longer there, so we proposed economic integration of Eastern and Western Europe, and when the Soviet Union disintegrated in ’91, we simply extended the so-called “Productive Triangle” to connect from the European industrial and population centers to those of Asia through infrastructure development corridors, and we called that Eurasian Land-Bridge the New Silk Road. And we kept making new projects, we kept developing this idea further for every part of the world, for Latin America, for Africa, for the Middle East, and naturally when China put this officially again on the agenda, which they had done already in ’96, and that was halted through the Asia crisis; but when Xi Jinping again put the perspective of the New Silk Road on the table, in 2013, we intensified these studies and produced a 370-page study called “The New Silk Road Becomes the World Land-Bridge.” And when you look at the projects of that blueprint you can actually see that what China is doing right now with all the projects I named before, is growing very, very rapidly to fill out the proposed projects of the World Land-Bridge. From that standpoint it is not a question, should the rail line built from Brazil to Peru or from Brazil to Bolivia to Peru, because all of these will be built in this larger World Land-Bridge. In the beginning, when this discussion occurred in 2013, many countries in Central Asia had exactly the same debate. They said, “Oh, this New Silk Road is not good, because it only proposes the east-west alliance between China and Europe, and we want the north-south alliance from Central Asia to Russia.” This is all solved, because latest at the big conference in Vladivostok in September and then following other conferences last month in St. Petersburg and Moscow, the full integration of the Eurasian Economic Union with the New Silk Road/ One Belt, One Road Initiative is already taking place. What is really happening is that the Chinese economic model has become the most attractive economic model in the world, because China, like Germany by the way in the postwar period, China also had a real economic miracle, where China was able to to speed up the economic development for which the industrialized countries needed 200 years, China to do this in essentially 30 years; and therefore when China had offered in 2013 the participation in that model on a “win-win” basis what Xi Jinping really offered is the idea that every country in the world can participate in the kind of development which China has demonstrated. China has obviously the so-called “Chinese characteristics,” which means a very strong influence of Confucian philosophy. It also means naturally a one-party system which many countries don’t have. But in principle other countries can approximate this model absolutely if they focus on that which China was focussing on in its economic model, namely excellence in education, all the time new innovation, lifelong learning of the labor force, and leapfrogging technology — in other words the idea that developing countries must not repeat all the steps the industrial countries have taken, but they can choose certain state-of-the-art technologies and become the best in these areas, and in that way pull the other areas of the entire economy upward. The Chinese model has become so attractive that it is very, very clearly the centerpiece of a completely new dynamic, and a strategic realignment of many countries. The fact that there is such an option now has already changed the world. The option for development for the developing countries did not exist since the assassination of John F. Kennedy, or actually since Franklin D. Roosevelt, it existed for a short period with John F. Kennedy, but for the last 50 years, there was to the contrary the clear attempt to prevent development of the developing sector. You had the completely fraudulent theses of the Club of Rome saying that there are “limits to growth,” that we have somehow reached the end of the ability of the planet to grow. This was the basis for the creation of the Green movement. The Club of Rome and the famous book Limits to Growth was based on a completely fraudulent theses, that the resources are limited, leaving out, consciously, the fact that what is a resource is entirely determined by the level of technology with which you work on that raw material. You have either a stone to kill your neighbor in the Stone Age, or you have a piece of iron, or rare earth mineral, something an engineer can make absolutely the most advanced things out of, that entirely depends on the level of technology which determines what kind of raw material you have. In the time of the first two decades after the Second World War, in the United Nations you still had what was called at the time, “UN Development Decades” which was the idea that each decade would lead to an improvement of the developing countries. But that was then replaced by a completely different idea. In 1967, Pope Paul VI still produced an Encyclical which he called Populorum Progressio, which was the idea that every country had the right for full development. After this paradigm shift of the Club of Rome/zero growth oligarchy, they replaced the right to development with such notions as overpopulation, sustainable development, appropriate development, which was really a synonym for no development at all. Now, with the New Silk Road/One Belt, One Road Initiative, and the alternative financial system, the AIIB and so forth, you have for the first time, again the chance to completely break out of this containment. But it is also clear that the international oligarchy which was behind this zero growth movement is still waging a war against development. I’ll give you one example: The so-called Saïd Business School of Oxford University published a completely absurd report in September of this year, where they say that infrastructure investment of China in the last decade of altogether $10.8 trillion would be the cause of a pending collapse of the economy in China, and consequently of the world economy. This is absolutely ridiculous, and the idea behind it is that infrastructure is not profitable. When we talk about infrastructure, we’re not talking about transport lines from A to B; but we are talking about — in other words that the profit of such infrastructure would come out of a toll booth of a privatized highway or a privatized railroad. But we are talking about infrastructure in the context of physical economy, that it creates the absolute necessary framework for the development of agriculture, industry, the productivity of the labor force, and the unleashing of the creative powers of mankind. Now infrastructure is only one aspect of what Lyndon LaRouche has called “physical economy,” a notion which actually originated with Gottfried Leibniz, who used it for the first time in the context of the discovery of the steam engine and the increase of productivity through the input of science and technology in the production process. This tradition continued through the cameralists, through Friedrich List, the author of the Customs Union in Germany, and the one who very clearly in his economic theoretical writings made the distinction between the American System of economy and the English system — the fundamental difference between the national economy of Alexander Hamilton, the United States’ first Secretary of the Treasury, and the free-trade advocate, Adam Smith. It is the fight between these two systems which is going on to the present day. It is the fight between the oligarchical system trying to get maximum profit by keeping the population down and backward, and the republican model of economy which says that the only source of wealth is the creative abilities of the population. Friedrich List is, to the present day, the most known and most studied economist in China. At the Fifth World Congress in China in 2013 in Shanghai, the majority of economists said that they based the Chinese economic model primarily on the theory of List. List maintained that the development of the productive powers of labor and the industrial capacities is the much more important than so-called statistical wealth, monetary values, or like asset-driven economies like the United States and Great Britain. Friedrich List wrote for a contest for the French Academy of Sciences in 1837; he developed a vision for the future role of transport systems, which he called a space and time economy, ideas which are still completely valid for today. Now, Friedrich List saw in the continuous perfection of transport and communications systems the precondition for the progress of humanity, enabling human beings to unfold increasingly the potential given to him by nature. The idea was that the more talents could exchange their ideas and collaborate in all areas, the greater progress would be in all areas of knowledge, and the more science and art would be inspired and spread to all sectors and disciplines. And, totally fit for our present jet age, he said that the easier it would be for human beings to move from place to place, the more they would save time and compress space. The more the development and efficiency of his powers would increase and utilize the material riches of nature for his purposes. He said the impact of this characteristics of the space and time economy would be demonstrated by the wealth of nations which would develop an advanced transport and communications system even if their natural environment was unfavorable. The high degree of speed, regularity and cost-efficiency of transport would facilitate new levels of the development of the mental and material productive forces. In an almost prophetic forecast, he saw this new development orient towards the uniting of all nations in one humanity, in a republic of the planet based on the economy of mankind. Friedrich List was a visionary. And indeed, the World Land-Bridge which he anticipated is the natural next phase in the evolution of mankind. And I want to also remind of some other great person, whose ideas are very relevant for this, and that is the great German rocket scientist Krafft Ehricke, who looked at the long arc of the evolution of the development of our planet and mankind. He outlined how life has developed out of the oceans with the aid of photosynthesis to the land; how it then came to the evolution of one species to the next, always having a higher energy-flux density in their metabolism until you finally arrive at the human being who is distinct from all previous species, through his creative intellect, through his creative reason which is not shared by any animal or any other possible form of life. Now, in the early development, this human being, or man, only could settle on rivers or on oceans. Then as the development continued, with the help of infrastructure, man could open up the landlocked areas of the planet and as the technological development became more efficient, man developed railways and in that sense the World Land-Bridge conception, which will open up the remaining landlocked areas of the planet, is really the logical next phase of the evolution of man. And it does not stop here, because the next phase of the evolution is to bring this infrastructure into near space. The industrialization of the Moon which the Chinese are most advanced in pursuing, is the obvious stepping stone for larger excursions into near space, to develop a much better understanding of the laws of our Solar System, of the Galaxy, and finally the laws of the Universe at large. In order to solve the problems on Earth today, we all must assume the view of the astronauts, the cosmonauts, the taikonauts who all report when they come back from space, when the look down they only see our small, fragile, blue planet, and you don’t see borders, you don’t see divisions, you see one mankind, and one planet. So obviously, Earth is not what the environmentalists claim, an Earthbound, closed system, but life on Earth is part of the laws which are defined in the Solar System, and in the larger scale, defined by the Galaxy. So therefore, the solutions to all the problems on our planet have to take into account what is going on in the space around is and the interaction, for example, of the Solar System with Galaxy, the impact that has on the climate and similar things. Now we can also, from that large arc of evolution determine the necessary next step of discovery, where must we put the focus. Because mankind should not vanish — you know there are many geologists who say that mankind only appeared one second before midnight, and will disappear one second after midnight in the longer arc of the evolution of the Universe. Now, I don’t think that that is an acceptable view, because mankind is capable of mastering the laws of the Universe, and if mankind would vanish then all the great works of our forebears, of such musicians and composers, like Bach and Beethoven would have been in vain, because they would vanish. But mankind can go on a path of scientific and technological progress, where we will overcome all hurdles which we already can see clearly in existence, such as asteroids or developments on the Sun which affect the planet Earth; but we can encounter a path of overcoming these. Now, let me go back to what I started with. The U.S. election has created a potential to go in this direction. The absolute precondition is that the relationship between the United States and Russia and the United States and China must be put on a new basis: This is absolutely crucial for world peace, it is absolutely crucial to solve the terrible crisis in Syria, in Ukraine. Therefore, in order to make all of these things a reality, we need a completely new set of international relations among nations. We have to proceed from the UN Charter which has the absolute respect for the national sovereignty of all countries, which follows the principle of non-interference, respect for the different social systems. President Xi Jinping has offered a new model of the relations among major powers which says, basically exactly that: non-interference, mutual respect for the sovereignty of the other. But these are the principles which also must guide the relations of the countries working together on the One Belt, One Road. This must be defined from the idea, where do we want mankind to be in a thousand years from now? Or in 10,000 years from now? And if you think back, 10,000 years ago, from the standpoint of the development of the Universe, it’s a very small part of time, so we have made a gigantic leap in the last 10,000 years. And I imagine we will make an even more gigantic leap in the next 10,000 years, and if we are going to survive as a human species, we will have to change the way we think about our kind completely. We have to think about it from the standpoint of a unified humanity. Friedrich Schiller, who is the wonderful poet, according to whom the Schiller Institute is named, was of the opinion that there must not be a contradiction between being a patriot and being a world citizen. I think that that idea is reachable in our time, because if we give every child, newly born on this planet, a universal education which transmits not only universal history, geology, music, science, the arts, but also a knowledge and love for the other cultures in their highest expression, of the German Classics, of Confucianism, of the Gupta period, of the Cervantes, of Goya, of every high point of each culture, then these children will be able to develop the entire potential which each of them could unfold, and which in the past only very few exceptions could unfold. Now the immediate steps ahead to solve this crisis must be the following: We must have an immediate, global implementation of the Glass-Steagall law implemented by Franklin D. Roosevelt in 1933. We have to end the casino economy where money is reference point and not the development of the real economy and the creative potential of the population. This, then, naturally must be followed by the other three fundamental laws developed by Lyndon LaRouche which must be the creation of National Bank in every country in the tradition of Alexander Hamilton, who created the United States with that measure; and then a credit system in every country which gives credit lines for the development of infrastructure, research & development, education, and other things which contribute to the increase of productivity and creativity of the population; and then, we need a combination of such credit systems through a New Bretton Woods system which will be the relation among the national economies and organizing the international investments in the projects of the World Land-Bridge, which will have international clearinghouses, to compensate for the fact that nations are different. They’re not all the same: you have small nations, large nations, thinly or greatly populated countries; we have countries which have a lot of raw materials, others have few or none; you have countries which have skilled labor, others have not so skilled labor forces. And you need a development perspective of at last 20, 30, 40, 50 years, in order to overcome that, and these clearinghouses must be what calculates that and makes sure that the bad practices of the World Bank which demanded payback of credit before the projects were realized, that this practice is replaced by a complete focus on the completion of these projects and the fulfillment of their potentials. So therefore, as you could see by my remarks, we are not only talking about rail lines from Brazil to Peru, or infrastructure as such. We’re really talking about a completely new paradigm in the thinking of mankind; we are talking about a new era of civilization where all human beings, every single child born on the Earth, will have the potential to develop every aspect of the potential embedded in him or her. Now the future of mankind, if we are supposed to exist, will therefore be that we will have a lot more geniuses, that it will not be that we will have a genius once in a century, like Plato, Confucius, Beethoven, or Einstein. But that will be increasingly the new normal identity of civilization. So in that spirit, I think we are hopefully at the beginning of a completely new era of mankind. This entry was posted in LPAC, The Hamiltonian and tagged fusion economy, Glass Steagall, Hamiltonian Credit System, human progress, LaRouche's Four Laws, National banking, new economic order, new financial architecture, scientific discovery, win-win. Bookmark the permalink.